A valve Positioner is a device used to increase or decrease the air load pressure driving the actuator until the valve’s stem reaches a “POSITION” balanced to the output SIGNAL from the process variable instrument controller. 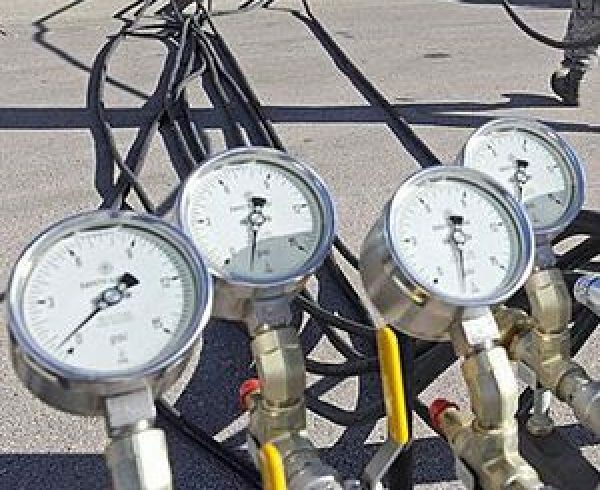 Valve positioners are used on controlling valves where accurate and rapid control is required without error or hysterises. Positioners are generally mounted on the side-yoke or top casing of the pneumatic actuator for linear sliding stem control valves, and at/near the end-of-shaft for rotary control vales. 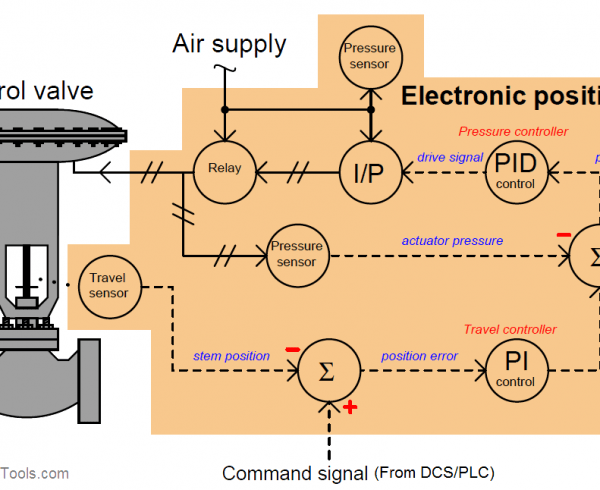 For either basic design type, “mechanical feedback linkage” connected directly to the valve’s stem provides feedback to controller. 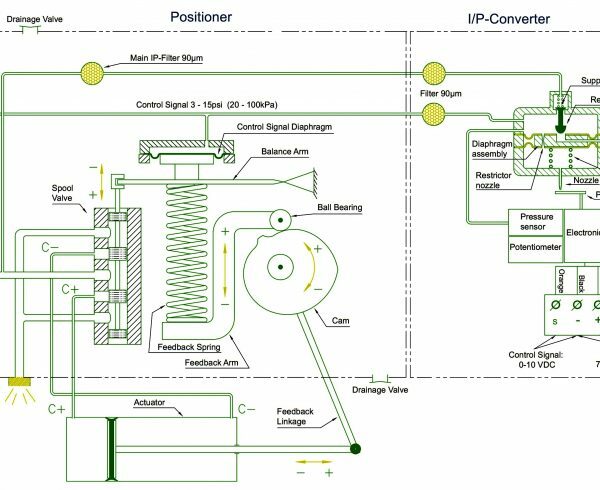 The process controller tells the positioner to “change” position; the feedback linkage reports back to the positioner confirming that a change has occurred and gives a “sense” of the magnitude of the change in position. 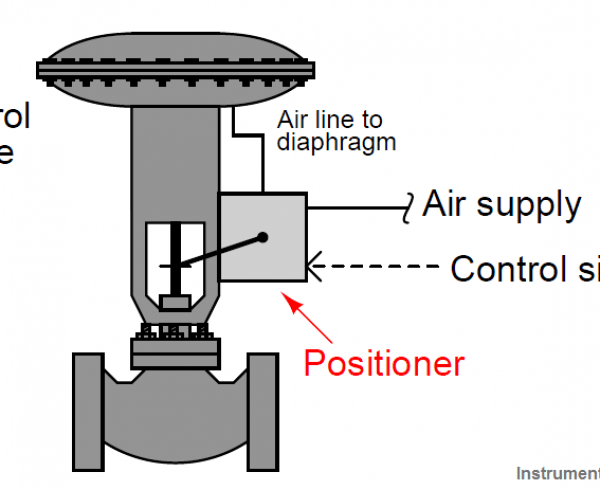 The Figure shows a valve positioner . The valve positioner is a force-balanced instrument, with pneumatic module installed on a double-acting actuator for air to open action. Positioning is based on a balance of two forces; one proportional to the instrument signal and the other proportional to the stem position. A downward force is activated as the signal pressure acts upon the diaphragms in the instrument signal capsule, through the follower arm and cam, the motion of the actuator stem is transmitted to the top end of the feedback spring resulting in the varying of tension in feedback spring as stem position changes. The system will be in equilibrium and stem will be in the position called for by the instrument signal when these opposing forces balance exactly. The balance will move up or down and by means of the spool valve, will change the output pressures and flow rate if these opposing forces are not in balance. This will lead to the piston to moving until the tension on the feedback spring opposes exactly the instrument signal pressure. An increase in the instrument signal forces the instrument signal capsule and balance beam downward. This motion of the balance beam also pulls the pilot valve spool downward from its equilibrium position. This opens the pilot valve ports, supplying air to port 1 and exhausting air from port 2. This causes the actuator piston upward. 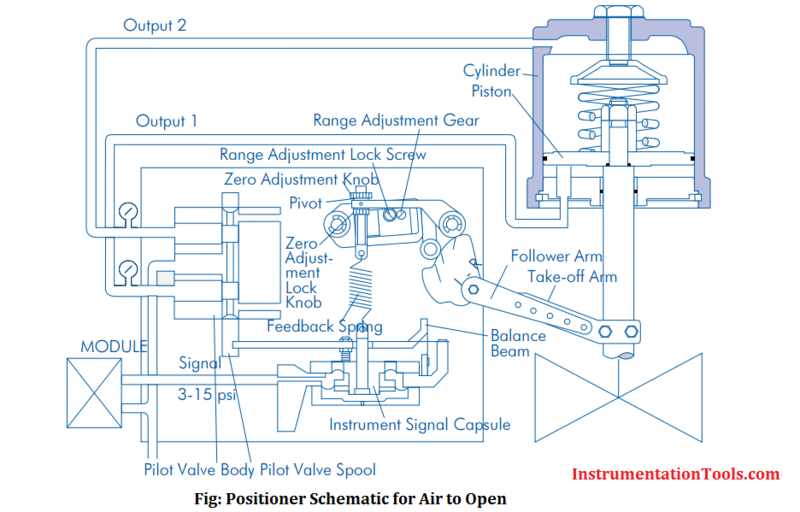 Proportionally to the valve position, to counter the force generated by the instrument signal capsule, the piston continues to stroke upwards until force in the feedback spring increases sufficiently. At this point the balance beam and spool begin to return to equilibrium position. 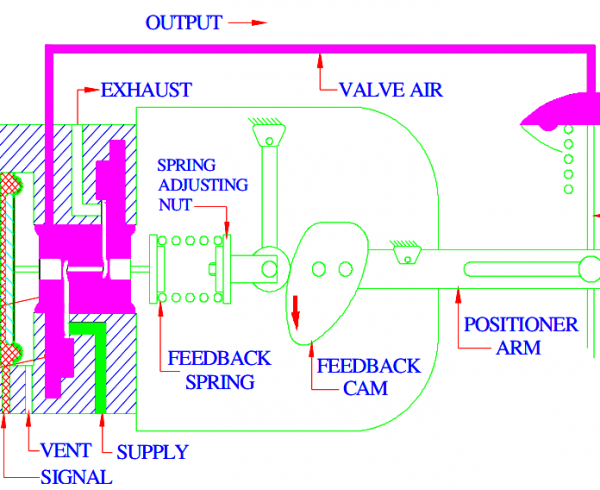 As the valve spool ports start to close, the air flow rate to the actuator is decreased. The feedback spring tension force will equal the force generated in the instrument signal capsule after the piston has reached the required position. The balance beam and instrument signal capsule will remain in their equilibrium positions with no air flowing to the actuator until a change in the instrument signal is made. A proportional downward movement of the actuator piston and stem is affected by a decrease in the instrument signal which reverses the described actions. 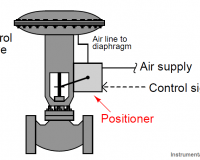 A valve positioner consists of a very high gain amplifier- this may be pneumatic, electropneumatic etc, and a feed back link which detects the actual position of the valve. The required movement is for the valve to close. The input pressure from the controller to the bellows falls. The flapper moves away from the nozzle and the pressure after the orifice falls. The pressure to the diaphragm falls and the valve begins to close. 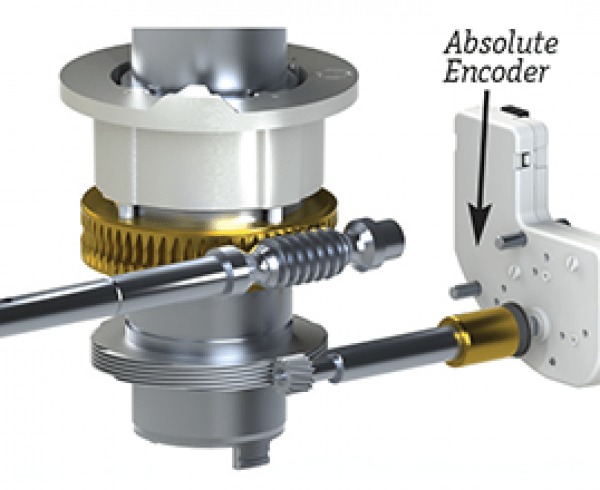 The feed back arm moves up rotating the cam clockwise. This raises the beam increasing back pressure in the nozzle until equilibrium is again achieved. 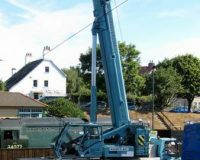 When valves are handling sludge or solids in suspension.